The latest alleged part leak was posted online on Wednesday by Sonny Dickson, with a picture claiming to show the logic board of the new iPhone with a processor named A6. If accurate, the naming suggests that the new processor would be a generational upgrade from the A5 chip found in the iPhone 4S, as well as the A5X chip with upgraded graphics that Apple included in the third-generation iPad. While the image posted Thursday shows a logic board that matches up with previous photos posted online, the quality of the image itself is so low that the picture could easily have been faked. Official details on Apple's next iPhone are not expected to be revealed until the company's anticipated media event on Sept. 12. In previous years, Apple introduced its next-generation custom chips in the company's latest iPad model. The A4 first debuted in the first-generation iPad in 2010 before coming to the iPhone 4, while the A5 was introduced in the iPad 2 in 2011 before it showed up in the iPhone 4S. This year, however, the new iPad with Retina display did not pack in a new A6 processor, with the A5X instead serving as a modest upgrade with improved graphics capabilities to drive the new high-resolution screen. One report in early July claimed that Apple's sixth-generation iPhone, commonly referred to in the media as the "iPhone 5," will feature a quad-core ARM processor based on Samsung's Exynox 4 architecture. Other details, including clock speed or graphics processing capabilities, were not mentioned. 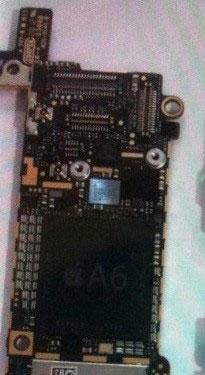 The A5 chip in the iPhone 4S is a dual-core processor clocked at 800 megahertz. In the iPad 2, the A5 runs slightly faster at 1 gigahertz, thanks to a larger form factor with a bigger battery. As for the A5X chip, it's based on Samsung's 45-nanometer low-power architecture, also found in the A5 CPU in the iPhone 4S and iPad 2.